Over the summer, I conducted an interview series “Design Phase Zero”, where I met with local Austin designers, including interior design, fashion design, and entrepreneurs. This week, we’re kickin’ it back up again with our final designer of the series! Last, but certainly not least, architect Beau Frail shares his design processes covering the community-based and sustainability realm of architectural design. 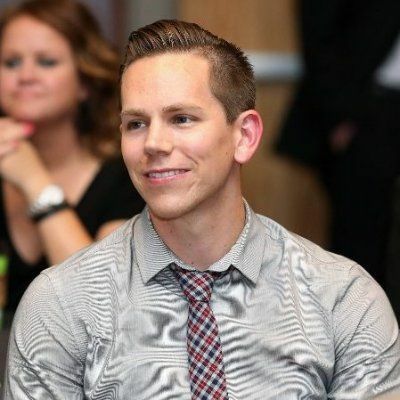 Beau Frail earned his undergraduate degree from the University of Florida and went on to the University of Texas to earn his graduate degree in architecture. He worked as a Project Architect Michael Hsu Office of Architecture for two years, but has found his passion using architecture to benefit communal needs. Recently, Beau has been heavily involved in his Tiny Victories competition that provided micro-home designs for Community First! Village, which is an affordable housing community for the homeless. Tell us about your background. How did you get involved with architecture? Where did your passion for architecture stem from? “Since I can remember, I've always wanted to be an architect, but I didn't really know what was involved with architecture. I've never met an architect and none of my family was one, but I always loved expressing myself creatively and enjoyed drawing. “One experience I had that impacted me greatly in deciding to pursue architecture was a mission trip I took to Haiti when I was in high school. It was quite a culture shock stepping out of my South Florida bubble where I grew up. I witnessed impoverished conditions for the first time-- unstable homes constructed of scrap materials surrounded by clear-cut mountainsides eroding away from environmental degradation. And while I’ve always known I wanted to be an architect, it was through experiencing these communities in need and serving others in Haiti that planted the seeds for HOW I wanted to be an architect. “I wanted to somehow make people's lives better in an impactful way. What problems are you trying to solve in the architecture space? “Let’s use our creative potential to address truly pressing needs throughout Austin. “Design should be empowering disadvantaged communities, ensuring sustained affordability of our neighborhoods, planning for walkable and connected cities, preserving our diverse cultural heritage, protecting our natural environments, and designing equitable, sustainable, and healthy buildings for all. “Placemaking is about seeing the areas you are impacting and designing as more than just a structure— it's about making a place where people can interact and make a greater community presence, rather than what you would typically just put there. How do you retain a character of a place, how do you infuse the public spaces with meaning and identity, and create places that people want to gather and feel drawn to that also serve their interests? Placemaking is a great participatory approach to answering these questions. What is the next project you’re working on? What has been your favorite project that you’ve completed? "I've had the pleasure to work on and facilitate some really amazing projects that speak to my passion for public interest design. I've been able to collaborate with great people on these projects through the Open Architecture Collaborative and a committee at AIA Austin called Design Voice, which I've been a part of since 2012. DesignVoice spearheads community outreach projects, like our DV3x2 high school internship program. We reach out to high schools, including Title I schools, and set up internships for young students who are interested in architecture, engineering, interior design, and landscape architecture. Through the Austin Foundation for Architecture, we’ve also been able to award scholarships to the students to support their college education. 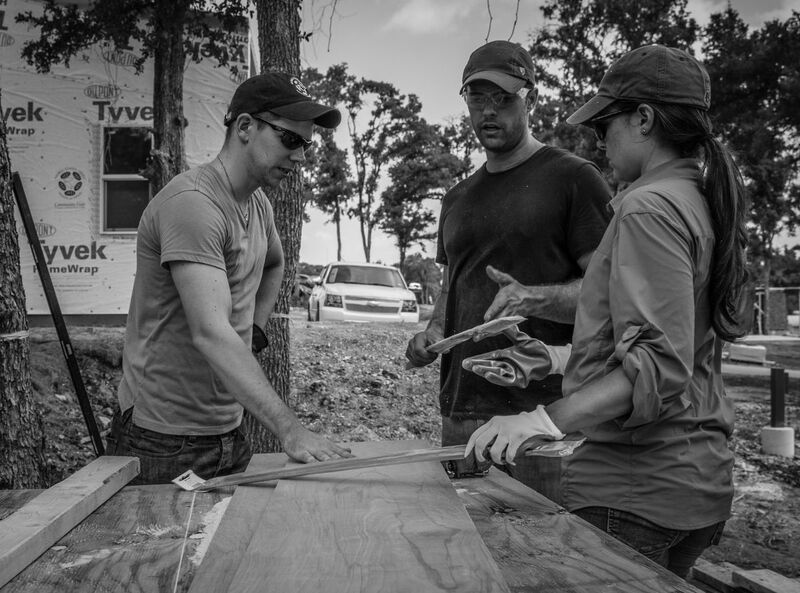 “DesignVoice facilitates projects for non-profits, connecting them with architects who can meet their needs. As volunteers we focus our capacity on creating design opportunities for the broader architectural profession. "By focusing our service in this way we feel we can make the biggest impact in our community. “AIA Austin DesignVoice assembled a collaborative team that facilitated the Tiny Victories design competition for Mobile Loaves and Fishes. 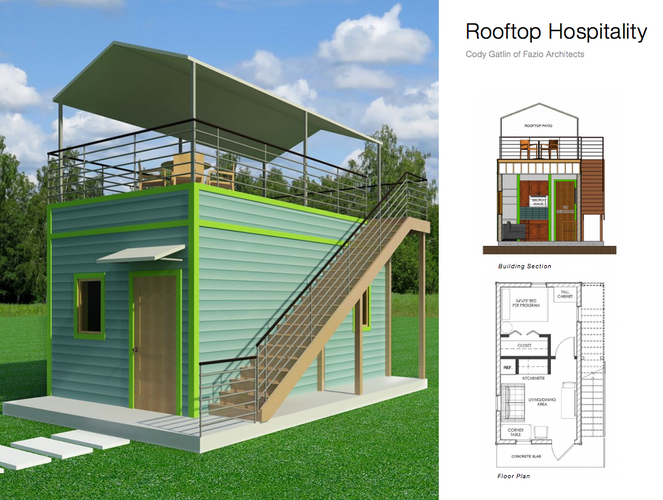 The goal was to create innovative designs for affordable and sustainable housing for the chronically homeless in Austin. There were 56 design submissions that a jury of local experts reviewed and ultimately 6 different micro-home designs were chosen to be built. “The design challenge was to make a small space functional, beautiful, and economical. The 6 micro-home designs from the competition contributed to the eclectic character of Community First! Village, which is providing a supportive community for our city’s homeless. “Community First! 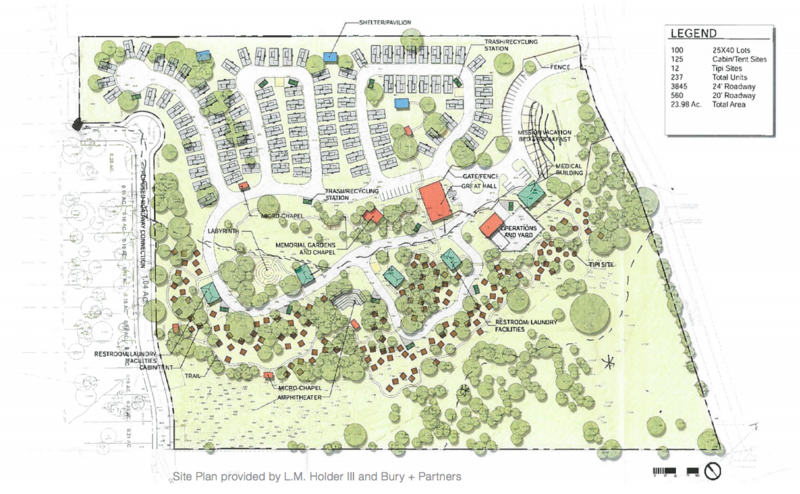 Village is about half RVs and half micro-homes and Phase I will house over 200 people. 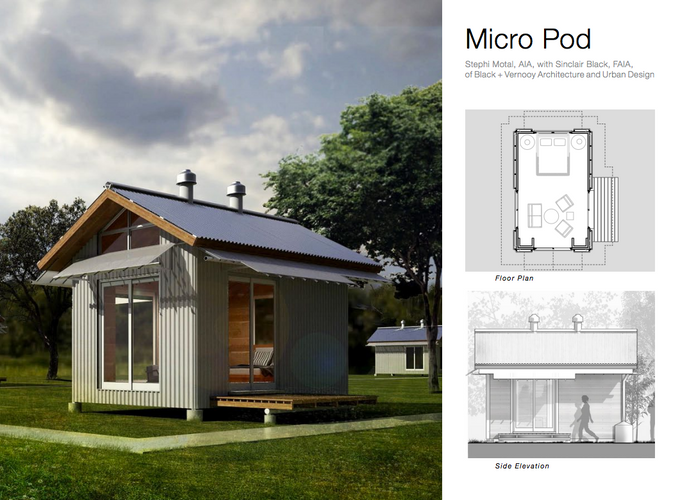 The micro-homes were designed by some of the best architects in town. 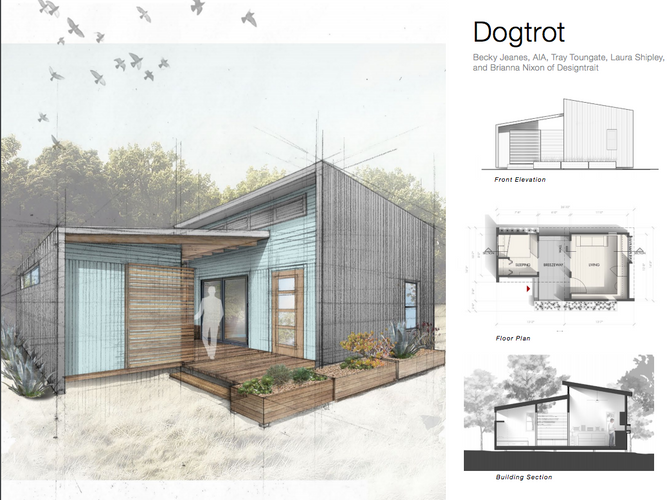 Design Trait’s “Dogtrot” is oriented to catch the Texas summer breeze and provides a separate sleeping and living space. Black + Vernooy’s “Micro-pod” is one open space, which makes it feel larger and it's more flexible with porches on three of its sides. Cody Gatlin’s “Rooftop Hospitality” design has a shaded patio on the roof, which effectively doubles the footprint of the house. “This is a really rewarding project to be a part of, and Design Voice is doing so much good. There's already about 100 people living there right now. It has an organic garden in the middle and an Alamo Drafthouse outdoor movie theater; they have a market where you can buy food, and a metalsmith and glass blower where people can work with various programs. The peoples’ social security and Medicare is able to cover living costs. 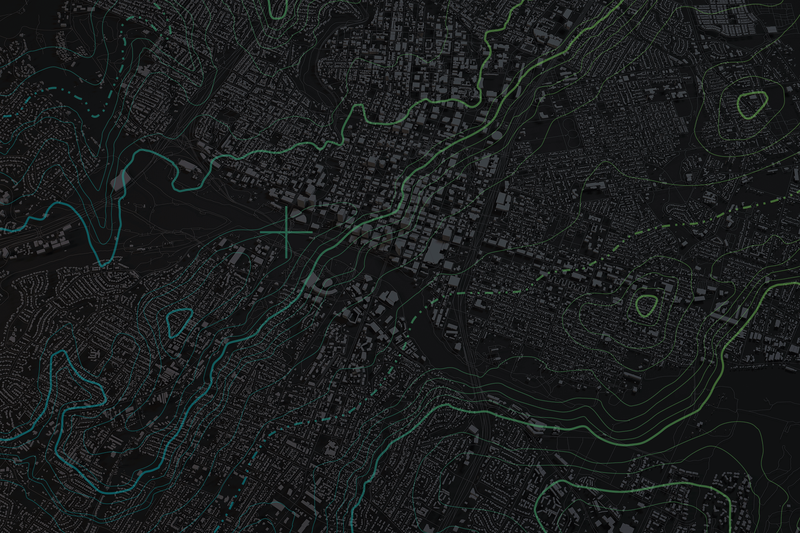 Finding a place for $250 in Austin is impossible, except for here. “I'm also going to Chicago for a month to work for a fellowship called Latent Design, a leading practice in the field of social impact design. I will have the opportunity to explore using public space as a catalyst for community connectivity and examine how their practice actualizes projects through the community design process. Tell us about preparations for when you start a new project. What considerations go into that level of design? “The approach for a public interest design project is to effectively redesign the standard linear design process into one that includes stakeholder feedback and progresses the design via iterative collaboration. The intent with participatory design is to ensure that as the design develops, you’re not looking over those who have an inherent stake in the project and making sure to facilitate opportunities for them to share valuable contributions and perspectives. It’s about looking at the design process holistically and being a good listener to the needs of the community. While this may make the design process longer, the end result will be more inclusive and representative of those the project will serve. A truly sustainable building is one that people love and the community is committed to preserving and caring for for generations to come. 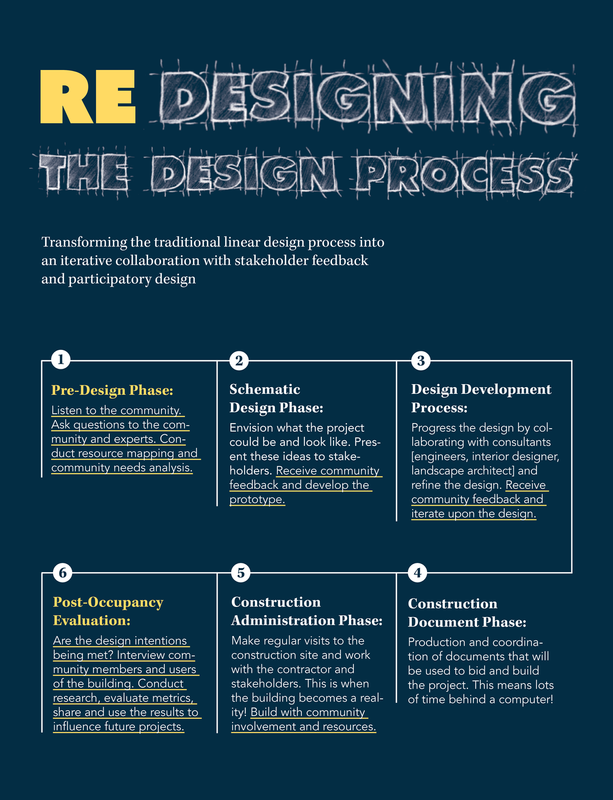 "While the traditional design process is still largely intact in the public interest design process, there are two added phases you engage in at the beginning and the end that are essential as well as community feedback that is sprinkled within the more traditional phases (refer to graphic). There's a larger predesign phase, which involves the community, and a larger post project phase, which is the follow up (are the intentions you had in your design working?)." Where/ who do you find inspiration for projects? Can you share some favorite links or books with us? “I love what Impact Hub is doing. Impact Design Hub is ran through Autodesk, and it has great resources, like online blogs. Structures for Inclusion is another design conference that holds a public interest design institute, so they're actually going around to schools and giving a 3-day workshop where you learn about pretty much everything we've been talking about. SXSW does their social impact track and their Social Good Hub, which is pretty awesome. “There are some good books too. Design Like you Give a Damn, Architecture of Change, Expanding Architecture: Design as Activism published by Brian Bell, and a few others." Where do you see yourself in the next 5-10 years? Include your dream project/ building you would want to design. 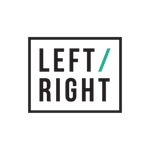 “This may be a little vague, but I'd love to be leading within a collaborative of designers, policy makers, and planners who care deeply about this type of work and making a positive impact in the community. “I want to lead within a collaborative practice that's working with communities to holistically address the challenges to build their environments that their communities are facing. Architecture is the combination of art and science that encompasses creativity, physics, and math to create humanistic and magnificent structures, and Beau’s strong passion to help the community and focus his talents to benefit the greater good of society is admiring and inspiring. That concludes our Design Phase Zero Series! Make sure to be on the lookout for the 2017 Austin Design Week schedule that’s releasing next week.